Croup is a common, primarily pediatric viral respiratory tract illness. As its alternative names, acute laryngotracheitis and acute laryngotracheobronchitis, indicate, croup generally affects the larynx and trachea, although this illness may also extend to the bronchi. This respiratory illness, recognized by physicians for centuries, derives its name from an Anglo-Saxon word, kropan, or from an old Scottish word, roup, meaning to cry out in a hoarse voice. Croup manifests as hoarseness, a seal-like barking cough, inspiratory stridor, and a variable degree of respiratory distress. However, morbidity is secondary to narrowing of the larynx and trachea below the level of the glottis (subglottic region), causing the characteristic audible inspiratory stridor (see the image below). Child with croup. Note the steeple or pencil sign of the proximal trachea evident on this anteroposterior film. Courtesy of Dr. Kelly Marshall, CHOA at Scottish Rite. Stridor is a common symptom in patients with croup. Acute onset of this abnormal sound in a child alarms parents and caregivers, enough to prompt an urgent care or emergency department (ED) visit. Stridor is an audible harsh, high-pitched, musical sound on inspiration produced by turbulent airflow through a partially obstructed upper airway. This partial airway obstruction can be present at the level of the supraglottis, glottis, subglottis, and/or trachea. During inspiration, areas of the airway that are easily collapsible (eg, supraglottic region) are suctioned closed because of negative intraluminal pressure generated during inspiration. These same areas are forced open during expiration. For patient education information, see the Lung Disease and Respiratory Health Center, as well as Croup. Viruses causing acute infectious croup are spread through either direct inhalation from a cough and/or sneeze, or by contamination of hands from contact with fomites with subsequent touching the mucosa of the eyes, nose, and/or mouth. The most common viral etiologies are parainfluenza viruses. The type of parainfluenza (1, 2, and 3) virus causing croup outbreaks varies each year. The primary ports of viral entry are the nose and nasopharynx. The infection spreads and eventually involves the larynx and trachea. The lower respiratory tract may also be affected, as in acute laryngotracheobronchitis. Some practitioners feel that with lower airway involvement, further diagnostic evaluation is warranted to address concern for a secondary bacterial infection. Inflammation and edema of the subglottic larynx and trachea, especially near the cricoid cartilage, are most clinically significant. Histologically, the involved area is edematous, with cellular infiltration located in the lamina propria, submucosa, and adventitia. The infiltrate contains lymphocytes, histiocytes, neutrophils and plasma cells. Parainfluenza virus activates chloride secretion and inhibits sodium absorption across the tracheal epithelium, contributing to airway edema. The anatomical area impacted is the narrowest part of the pediatric airway; accordingly, swelling can significantly reduce the diameter, limiting airflow. This narrowing results in the seal-like barky cough, turbulent airflow, stridor, and chest wall retractions. Endothelial damage and loss of ciliary function also occur. A mucoid or fibrinous exudate partially occludes the lumen of the trachea. Decreased mobility of the vocal cords due to edema leads to the associated hoarseness. In severe disease, fibrinous exudates and pseudomembranes may develop, causing even greater airway obstruction. Hypoxemia may occur from progressive luminal narrowing and impaired alveolar ventilation and ventilation-perfusion mismatch. Spasmodic croup (laryngismus stridulus) is a noninfectious variant of the disorder, with a clinical presentation similar to that of the acute disease but typically without fever and with less coryza. This type of croup always occurs at night and has the hallmark of reoccurrence in children; hence it has also been called “recurrent croup.” In spasmodic croup, subglottic edema occurs without the inflammation typical in acute viral disease. Although viral illnesses may trigger this variant, the reaction may be of allergic etiology rather than a direct result of an infectious process. Parainfluenza viruses (types 1, 2, 3) are responsible for about 80% of croup cases, with parainfluenza types 1 and 2, accounting for nearly 66% of cases. Type 3 parainfluenza virus causes bronchiolitis and pneumonia in young infants and children. Type 4 parainfluenza virus, with subtypes 4A and 4B, is not as well understood and tends to be associated with a milder clinical illness. Infection with influenza A is associated with severe respiratory disease, as it has been detected in children with marked respiratory compromise. The bacterial pathogen, Mycoplasma pneumoniae, has also been identified in a few cases of croup. Prior to 1970, diphtheria, also known as membranous croup, was a common cause of croup-like symptoms. Vaccine coverage for diphtheria has eliminated this infection with no case reported in the United States for decades. Croup is the most common pediatric illness that causes acute stridor, accounting for approximately 15% of annual clinic and emergency department visits for pediatric respiratory tract infections. Croup is primarily a disease of infants and toddlers, with an age peak incidence of age 6 months to 36 months (3 years). In North America, incidence peaks in the second year of life, with an incidence of about 5-6 cases per 100 toddlers. Although uncommon after age 6 years, croup may be diagnosed in the preteen and adolescent years, and rarely in adults. The male-to-female ratio for croup is approximately 1.4:1. The disease occurs most often in late fall and early winter, but may present at any time of the year. Approximately 5% of children will experience more than 1 episode. Some evidence suggests that hospitalization for croup may be associated with future development of asthma. Children hospitalized for croup have demonstrated higher levels of bronchial hyperresponsiveness and an allergic response to skin testing. Further factors that could contribute to asthma later in life are history of recurrent croup, family history of asthma, and smoking exposure in the home environment. Complications in croup are rare. In most series, less than 5% of children who were diagnosed with croup required hospitalization and less than 2% of those who were hospitalized were intubated. Death occurred in approximately 0.5% of intubated patients. A secondary bacterial infection may result in pneumonia or bacterial tracheitis. Bacterial tracheitis is a life-threatening infection that can arise after the onset of an acute viral respiratory infection. [8, 9, 10, 11] In this clinical scenario, the child usually has a mild to moderate illness for 2-7 days, but then develops severe symptoms. These patients typically have a toxic appearance and do not respond well to nebulized racemic epinephrine. Cases of suspected bacterial tracheitis require hospitalization with close observation, broad-spectrum antibiotics, and, occasionally, endotracheal intubation. Key bacterial pathogens are Staphylococcus aureus including methicillin-resistant strains (MRSA), group A streptococcus (Streptococcus pyogenes), Moraxella catarrhalis, Streptococcus pneumoniae, Haemophilus influenzae, and anaerobes. Pulmonary edema, pneumothorax, pneumomediastinum, lymphadenitis, and otitis media have also been reported in patients diagnosed with croup. Poor ability to maintain adequate oral intake, plus increased insensible fluid losses, can lead to dehydration; as such, patients may require intravenous fluid hydration to stabilize their fluid status. Male-to-female ratio for croup is approximately 1.4:1. Benson BE, Baredes S, Schwartz RA. Stridor. Medscape Reference by WebMD. January 26, 2010. [Full Text]. American Academy of Pediatrics. Parainfluenza Viral Infections. Pickering LK, ed. Red Book: 2003 Report of the Committee on Infectious Diseases. 26th ed. Elk Grove Village, IL: American Academy of Pediatrics; 2003. 479-81. Sung JY, Lee HJ, Eun BW, et al. Role of human coronavirus NL63 in hospitalized children with croup. Pediatr Infect Dis J. 2010 Sep. 29(9):822-6. [Medline]. Williams JV, Harris PA, Tollefson SJ, et al. Human metapneumovirus and lower respiratory tract disease in otherwise healthy infants and children. N Engl J Med. 2004 Jan 29. 350(5):443-50. [Medline]. [Full Text]. Worrall G. Croup. Can Fam Physician. 2008 Apr. 54(4):573-4. [Medline]. Bjornson C, Russell KF, Vandermeer B, et al. Nebulized epinephrine for croup in children. Cochrane Database Syst Rev. 2011 Feb 16. CD006619. [Medline]. Segal AO, Crighton EJ, Moineddin R, Mamdani M, Upshur RE. Croup hospitalizations in Ontario: a 14-year time-series analysis. Pediatrics. 2005 Jul. 116(1):51-5. [Medline]. Bernstein T, Brilli R, Jacobs B. Is bacterial tracheitis changing? A 14-month experience in a pediatric intensive care unit. Clin Infect Dis. 1998 Sep. 27(3):458-62. [Medline]. Donnelly BW, McMillan JA, Weiner LB. Bacterial tracheitis: report of eight new cases and review. Rev Infect Dis. 1990 Sep-Oct. 12(5):729-35. [Medline]. Edwards KM, Dundon MC, Altemeier WA. Bacterial tracheitis as a complication of viral croup. Pediatr Infect Dis. 1983 Sep-Oct. 2(5):390-1. [Medline]. Jones R, Santos JI, Overall JC Jr. Bacterial tracheitis. JAMA. 1979 Aug 24-31. 242(8):721-6. [Medline]. Sobol SE, Zapata S. Epiglottitis and croup. Otolaryngol Clin North Am. 2008 Jun. 41(3):551-66, ix. [Medline]. Hoa M, Kingsley EL, Coticchia JM. Correlating the clinical course of recurrent croup with endoscopic findings: a retrospective observational study. Ann Otol Rhinol Laryngol. 2008 Jun. 117(6):464-9. [Medline]. Johnson D. Croup. Clin Evid (Online). 2009 Mar 10. 2009:[Medline]. [Full Text]. [Guideline] Alberta Medical Association. Guideline for the diagnosis and management of croup. Alberta Clinical Practice Guidelines 2005 Update. [Full Text]. Guidelines for the diagnosis and management of croup. 2008 update. Alberta Medical Association. 2011. Chun R, Preciado DA, Zalzal GH, Shah RK. Utility of bronchoscopy for recurrent croup. Ann Otol Rhinol Laryngol. 2009 Jul. 118(7):495-9. [Medline]. Delany DR, Johnston DR. Role of direct laryngoscopy and bronchoscopy in recurrent croup. Otolaryngol Head Neck Surg. 2015 Jan. 152 (1):159-64. [Medline]. Wald EL. Croup: common syndromes and therapy. Pediatr Ann. 2010 Jan. 39(1):15-21. [Medline]. Swingler GH, Zwarenstein M. Chest radiograph in acute respiratory infections. Cochrane Database Syst Rev. 2008. (1):CD001268. [Medline]. Huang CC, Shih SL. Images in clinical medicine. Steeple sign of croup. N Engl J Med. 2012 Jul 5. 367(1):66. [Medline]. Kirks DR. The respiratory system. Practical Pediatric Imaging: Diagnostic Radiology of Infants and Children. 3rd ed. Philadelphia, Pa: Lippincott-Raven; 1998. 651-53. Bjornson C, Russell KF, Vandermeer B, Durec T, Klassen TP, Johnson DW. Nebulized epinephrine for croup in children. Cochrane Database Syst Rev. 2011 Feb 16. CD006619. [Medline]. Scolnik D, Coates AL, Stephens D, Da Silva Z, Lavine E, Schuh S. Controlled delivery of high vs low humidity vs mist therapy for croup in emergency departments: a randomized controlled trial. JAMA. 2006 Mar 15. 295(11):1274-80. [Medline]. Colletti JE. Myth: Cool mist is an effective therapy in the management of croup. CJEM. 2004 Sep. 6(5):357-8. [Medline]. Humidified air inhalation for treating croup [database online]. Cochrane Database of Systematic Reviews; 2006. Bjornson CL, Klassen TP, Williamson J, et al. A randomized trial of a single dose of oral dexamethasone for mild croup. N Engl J Med. 2004 Sep 23. 351(13):1306-13. [Medline]. Cetinkaya F, Tufekci BS, Kutluk G. A comparison of nebulized budesonide, and intramuscular, and oral dexamethasone for treatment of croup. Int J Pediatr Otorhinolaryngol. 2004 Apr. 68(4):453-6. [Medline]. Chub-Uppakarn S, Sangsupawanich P. A randomized comparison of dexamethasone 0.15 mg/kg versus 0.6 mg/kg for the treatment of moderate to severe croup. Int J Pediatr Otorhinolaryngol. 2007 Mar. 71(3):473-7. [Medline]. Fifoot AA, Ting JY. Comparison between single-dose oral prednisolone and oral dexamethasone in the treatment of croup: a randomized, double-blinded clinical trial. Emerg Med Australas. 2007 Feb. 19(1):51-8. [Medline]. Russell K, Wiebe N, Saenz A, et al. Glucocorticoids for croup. Cochrane Database Syst Rev. 2004. CD001955. [Medline]. Zoorob R, Sidani M, Murray J. Croup: an overview. Am Fam Physician. 2011 May 1. 83(9):1067-73. [Medline]. Kairys SW, Olmstead EM, O'Connor GT. Steroid treatment of laryngotracheitis: a meta-analysis of the evidence from randomized trials. Pediatrics. 1989 May. 83(5):683-93. [Medline]. Gates A, Gates M, Vandermeer B, Johnson C, Hartling L, Johnson DW, et al. Glucocorticoids for croup in children. Cochrane Database Syst Rev. 2018 Aug 22. 8:CD001955. [Medline]. Amir L, Hubermann H, Halevi A, Mor M, Mimouni M, Waisman Y. Oral betamethasone versus intramuscular dexamethasone for the treatment of mild to moderate viral croup: a prospective, randomized trial. Pediatr Emerg Care. 2006 Aug. 22(8):541-4. [Medline]. Geelhoed GC. Budesonide offers no advantage when added to oral dexamethasone in the treatment of croup. Pediatr Emerg Care. 2005 Jun. 21(6):359-62. [Medline]. Sparrow A, Geelhoed G. Prednisolone versus dexamethasone in croup: a randomised equivalence trial. Arch Dis Child. 2006 Jul. 91(7):580-3. [Medline]. [Full Text]. McGee DL, Wald DA, Hinchliffe S. Helium-oxygen therapy in the emergency department. J Emerg Med. 1997 May-Jun. 15(3):291-6. [Medline]. Vorwerk C, Coats TJ. Use of helium-oxygen mixtures in the treatment of croup: a systematic review. Emerg Med J. 2008 Sep. 25(9):547-50. [Medline]. Beckmann KR, Brueggemann WM Jr. Heliox treatment of severe croup. Am J Emerg Med. 2000 Oct. 18(6):735-6. [Medline]. Terregino CA, Nairn SJ, Chansky ME, Kass JE. The effect of heliox on croup: a pilot study. Acad Emerg Med. 1998 Nov. 5(11):1130-3. [Medline]. Weber JE, Chudnofsky CR, Younger JG, et al. A randomized comparison of helium-oxygen mixture (Heliox) and racemic epinephrine for the treatment of moderate to severe croup. Pediatrics. 2001 Jun. 107(6):E96. [Medline]. Vorwerk C, Coats T. Heliox for croup in children. Cochrane Database Syst Rev. 2010 Feb 17. CD006822. [Medline]. Moraa I, Sturman N, McGuire T, van Driel ML. Heliox for croup in children. Cochrane Database Syst Rev. 2013 Dec 7. 12:CD006822. [Medline]. Dobrovoljac M, Geelhoed GC. 27 years of croup: an update highlighting the effectiveness of 0.15 mg/kg of dexamethasone. Emerg Med Australas. 2009 Aug. 21(4):309-14. [Medline]. Bagwell T, Hollingsworth A, Thompson T, Abramo T, Huckabee M, Chang D, et al. Management of Croup in the Emergency Department: The Role of Multidose Nebulized Epinephrine. Pediatr Emerg Care. 2017 Sep 25. [Medline]. Moore M, Little P. Humidified air inhalation for treating croup: a systematic review and meta-analysis. Fam Pract. 2007 Sep. 24(4):295-301. [Medline]. Cruz CI, Patel D. Impacted Button-Battery Masquerading as Croup. J Emerg Med. 2013 Jan 30. [Medline]. Elbuluk O, Shiba T, Shapiro NL. 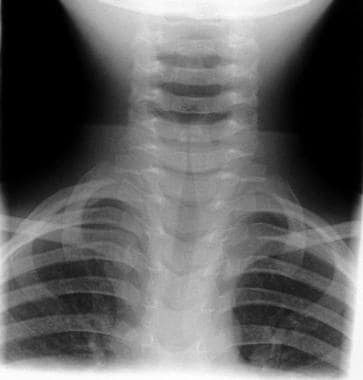 Laryngomalacia presenting as recurrent croup in an infant. Case Rep Otolaryngol. 2013. 2013:649203. [Medline]. [Full Text]. Ibrahimov M, Yollu U, Akil F, Aydin F, Yener M. Laryngeal foreign body mimicking croup. J Craniofac Surg. 2013 Jan. 24(1):e7-8. [Medline].